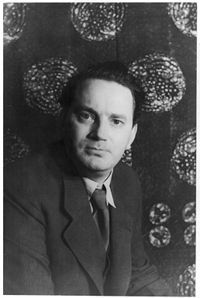 Thomas Wolfe, photograph by Carl Van Vechten, 1937. Thomas Clayton Wolfe (October 3, 1900 – September 15, 1938) was a twentieth century American novelist and short story writer. He is known for his autobiographical fiction written in highly original, impressionistic prose. His books, written during the Great Depression show an almost obsessive interest in the self, particularly the development of the self within the context of the family and community. In his personal life, the author was known by friends as an enthusiastic yet lonesome man, who often desired more than he was able to attain in happiness, health, and love. He died unmarried, young, and without having realized his full potential as an artist. His literary output included two novels published before his death: Look Homeward, Angel (1929), and Of Time and River (1935); and three published posthumously The Web and the Rock (1939), You Can't Go Home Again (1940), and The Hills Beyond (1941). He was known for his passionate writing that clearly conveyed the emotional side of human experience. Though the lyrical quality of his writing, his vigorous rhetoric, and his vast command of the English language was what made him popular to readers, to critics he was considered egotistical, undisciplined, and dependent on editors, who greatly improved his manuscripts. Thomas Wolfe was born in the mountain resort town Asheville, North Carolina, the last born of a large middle-class family. His mother, Julia E. Wolfe, was a successful real estate speculator, and his father, William Oliver Wolfe, was a tombstone maker. His ancestors on his father's side were German-Dutch-English farmers who had settled in Pennsylvania, and his mother was a third-generation North Carolinian of Scot-Irish-English stock. His parents married in 1885, giving birth to eight children of whom only six survived into adulthood. Mr. Wolfe's alcoholism eventually divided the couple in 1906, and young Thomas was the only child to go into the custody of his mother. During his childhood, the family member he felt closest to was his brother, Benjamin. From the age of eleven, Wolfe attended a local private school from which he would graduate shortly before he turned 16. On September 12, 1916, he began to go to school at the University of North Carolina at Chapel Hill, where he joined the Pi Kappa Phi fraternity and became editor of the school's newspaper. At Chapel Hill, Thomas developed an ambition for the theater through his work with the UNC Dialectic Society as well as the Carolina Playmakers. When Wolfe graduated, at age twenty, he went to Harvard to study playwrighting under Professor George Pierce Baker in his renowned 47 Workshop. The aspiring dramatist's first play at Harvard was The Mountains, a folk play about North Carolina. He received his Master of Arts Degree in Literature in two years, but stayed one year extra to further hone his skills as a playwright. Wolfe would later satirize the pretentiousness of Harvard life, and the 47 Workshop in particular, in his piece, Of Time and the River. Though Wolfe did not lack in talents, ultimately his personal style and temperament were not well suited to the theater, and he was unsuccessful in getting his plays produced after graduating from Harvard. He took work as an English instructor at New York University in 1924. He would teach there off and on until 1930, initially departing from the school after his first year there to work on his personal writing overseas in Europe. On his return voyage in 1925, he met the married Aline Bernstein, a successful set and costume designer in the New York theater, who was twenty years his senior. Thus began their turbulent affair which would last the next five years. In June of 1926, Mrs. Bernstein and Wolfe vacationed in England, where Thomas began to write what would become his breakthrough work, Look Homeward, Angel. In the late fall of 1928, while in Vienna on yet another trip to Europe, Wolfe received a letter from Maxwell E. Perkins, the legendary editor at Charles Scribner’s and Sons, asking him to meet with him in New York City to discuss his book. Perkins had also worked with Ernest Hemingway and F. Scott Fitzgerald and saw in Wolfe potential to equal them. The following year, in October, the book was completed and published by Scribner's, with a dedication to Mrs. Bernstein for her artistic, emotional, and financial support. Look Homeward created an uproar in the author's hometown, as over 200 characters in the novel were easily identifiable citizens of Asheville. The book was banned from the public library and people were encouraged not to read it. Death threats were even sent to Wolfe, and it was not until 1937, that he would feel safe enough to return to the town. Around this time, Thomas' affair with Bernstein had reached a breaking point. In March of 1930, the author was awarded a Guggenheim fellowship that allowed him to travel to Europe and stay there for the next year, also providing the opportunity to finally end his relationship with Aline. When he returned to New York in February of 1931, he rented an apartment in Brooklyn and worked to complete his second book. Initially, Wolfe had been grateful for the extreme editing conditions he had worked under with Perkins, who had become almost like a father to him. However, with his second offering, the multi-volume epic originally titled The October Fair, Wolfe became disgruntled. Perkins cut the piece down dramatically to create a single, bestseller-sized volume, which would be called Of Time and the River. The young author would stick it out at Scribner's for two more of his publications, From Death to Morning (1935) and The Story of a Novel (1936), but the painful editing process, and his own fears that he was becoming too dependent on Perkins, caused him to abandon his relationship with Scribner's in 1937, and switch to Harper and Row under the editorship of Edward Aswell. Despite his disagreements with Perkins and Scribner's and Sons, Wolfe, on his deathbed, wrote a moving letter to his former editor. He acknowledged that Perkins had helped to realize his work and had made his labors successful. In closing he wrote, "Let's think of the day we walked over the Brooklyn Bridge together, and the book had been published, and the first reviews were coming in, and the world with all its glory and beauty lay before us, and we were happy. That's the way I think of you now. I've met the dark man, and I don't think I was too afraid of him. But I know I have to go and I wanted you to get this before that happened." On a pleasure trip to the state of Washington with friends, soon after leaving Scribner's, Wolfe had come down with pneumonia. Complications continued and in September of 1938, he was admitted to John Hopkins Hospital in Baltimore, Maryland. There, Dr. Walter Dandy, the foremost brain surgeon in the country at that time, diagnosed Wolfe with tuberculosis of the brain. An attempt to operate on September 12th revealed that the entire right side of the patient's brain was overrun by the disease, and by this point it was too late for anything to be done. Three days later, on September 15th, 1938, never having regained consciousness, Thomas Wolfe died at the age of 37. He was interred at Riverside Cemetery in Asheville, next to his family at Riverside Cemetery. Another famous writer, O. Henry is buried in the same cemetery. When Wolfe hits it right with his gorgeous style, the effect is tremendously satisfying, emotionally like a symphony at its best…. When a little of the torment has expended itself, you will have the greatest artist America has ever produced. Though his opulent style has not dated well, it was considered very relevant by the generation that came of age in the middle decades of the century. It was Thomas Wolfe's writing that inspired the young Jack Kerouac to become an author, an influence most obvious in Kerouac's first novel, The Town and the City. Look Homeward, Angel was Wolfe's first novel. Published in 1929, by Scribner's, it is heavily autobiographical, and Wolfe uses the main character, Eugene Gant, as a stand-in for himself. It shows his maturing from birth to the age of eighteen in the fictional town and state of Altamont, Catawba, which many believe to be a not-so-subtle mirror of his hometown, Asheville, North Carolina. Many of the characters of Look Homeward, Angel were also strongly based on real people from Asheville, and were often not portrayed in a pleasing manner. This resulted in a certain estrangement between Wolfe and his hometown, and it is speculated that this formed some of the basis for his later work, You Can't Go Home Again. The title comes from the poem Lycidas by John Milton. Of Time and the River, published on March 8, 1935, by Scribner's, is the sequel to Look Homeward, Angel and was an even greater success. The book chronicles the maturation of the autobiographical character, Eugene Gant, in his search for fulfillment, making his way from small-town North Carolina to Harvard University, New York City, and Europe. Wolfe examines the passing of time and the nature of the creative process as Gant gradually embraces the urban life, recognizing it as a necessary ordeal for the birth of his creative genius as a writer. As P. M. Jack observed in The New York Times, "Of Time and the River is a triumphant demonstration that Thomas Wolfe has the stamina to produce a magnificent epic of American life." You Can't Go Home Again (1940) was one of two novels published posthumously from the October Fair manuscript. The last of Thomas Wolfe's novels, it tells the story of George Webber, who after having written a successful novel about his family and hometown, returns to find that town shaken by outrage and hatred over the truths exposed in the book. He begins a search for his own identity that takes him to New York City and a hectic social whirl: To Paris with an uninhibited group of expatriates, and Berlin, lying cold and sinister under Hitler's shadow. Wolfe's mother's boardinghouse, now the Thomas Wolfe Memorial, has become one of literature's most famous landmarks. He composed many passages and created many characters based on boyhood remembrances experienced in this house. On July 19, 1949, the Memorial opened for the first time to the public, with an admission charge of $0.30. The first year drew 1,300 visitors. The Thomas Wolfe Society was formed in 1979, responsible for various publications as well as an annual meeting held in different cities significant to Wolfe (Asheville, New York City, Paris). Wolfe was inaugurated into The North Carolina Literary Hall of Fame when it was established in 1996. The Thomas Wolfe Prize was established in 2000, by the Thomas Wolfe Society and the (UNC). It honors writers who share the same ambition, talent, and strength as Thomas Wolfe. Past recipients include: Tom Wolfe, The Electric Kool-Aid Acid Test; Larry Brown, Billy Ray's Farm; and Elizabeth Spencer, No Place for an Angel. Pat Conroy, who received the award in 2003, after his seventh book, My Losing Season, was released, related that his first teenage reading of Wolfe's Look Homeward, Angel was an event that set him on course to become a writer: "I learned from … Thomas Wolfe: A book can change your life and change it forever." After Wolfe's death, William Faulkner, considered by many to be the best writer of the Lost Generation-era, said that Wolfe was his generation's best writer; Faulkner listed himself as second. In 2000, O Lost, the original "author's cut" of Look Homeward, Angel, was reconstructed by Matthew Bruccoli and published. All of Wolfe's manuscripts are housed at the Houghton Library, Harvard University. Wolfe scholars continue to use these manuscripts to produce such works as the complete edition of The Party at Jack's, published in 1995. ↑ Ted Mitchell, Thomas Wolfe: An Illustrated Biography (Pegasus Books, New York, 2007). ↑ Gordon Bigelow and Laura Monti, Selected Letters of Marjorie Kinnan Rawlings (Gainesville: University of Florida Press, 1983). ↑ Powells.com, Synopsis of Time and the River. Retrieved August 4, 2007. ↑ University of North Carolina, Pat Conroy Receives 2003 Thomas Wolfe Prize. Retrieved August 4, 2007. All links retrieved September 12, 2013. "Home Page", Thomas Wolfe Memorial. "The Thomas Wolfe Collection", UNC University Libraries. "Audio Interview with Duane Schneider about Thomas Wolfe", Wired for Books. Thomas Wolfe's Gravesite, Find A Grave. Bloom, Harold. 1987. Passionate Beholder of America in Trouble. The New York Times. Roberts. Terry. Fall 2000. Resurrecting Thomas Wolfe Southern Literary Journal. This page was last modified on 21 September 2013, at 22:16.